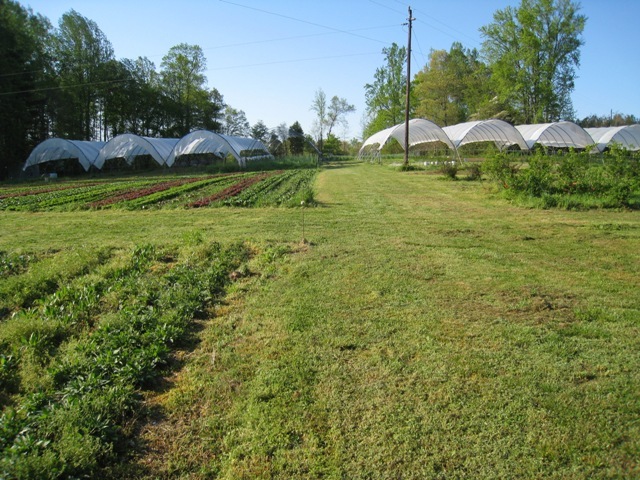 The second class was from the Sustainable Farming Program at Central Carolina Community College where many of the things we do here have been replicated like the passive solar greenhouse and another take on the sliding tunnel. This days subject was tomato and pepper production and as we have two tunnels with beautiful tomato plants growing and a greenhouse full of tomato and pepper transplants they are able to see the whole show, short of fruit to eat. The final group was the Organic Crop production class also from NCSU, the idea that they have such a class is somewhat amazing and an indicator of how far we have come. Again we are the last stop but this time they have been to several similar operations and it is harder to get their attention with talk of cover crops, rotations and beneficial insect habitats but I try. Which leads to this weekend, the 14th annual Spring Farm Tour. Saturday and Sunday, 1:00-6:00 each day. Our annual opening of the doors to the general public to come see the farm. Many of you have been on the Farm Tour before and it is a great opportunity to see many of the folks who sell at the Carrboro Market. Thousands of people go on the tour and it raises thousands of dollars for the work Carolina Farm Stewardship Association does. Sponsored by Weaver Street Market, who does an incredible amount of work to promote the tour and local agriculture, it is easy to go on the tour. Just pick up a map at the Carrboro Farmers’ Market or Weaver St. Market or many other local businesses and go to first farm that you want to see (we are #33 on this years map). The best deal is to buy a button ($25) which will be your pass for as many people as you can stuff into one vehicle, for as many farms as you want. 40 farms this year so you will have to choose, it is hard to do more than 3 maybe 4 farms in a day. In the mean time we have been mowing and picking up around the place and it’s looking pretty shiny around here, nothing like having hundreds of house guests all at once to make you buff up the joint! Come on out and see what we have been up to, the weather looks to be warm and beautiful!